My almost 4 year old daughter amazes me with her interests. One day she is a Princess playing dress up and having tea parties and the next she is digging up worms and in the dirt with her tractors! I love her diversity. Most recently she has started talking about planets and actually naming them. Not sure how she knows the planet names but either way I encouraged her and we talked more about it. A couple of weeks ago she asked if I would make her a rocket ship. 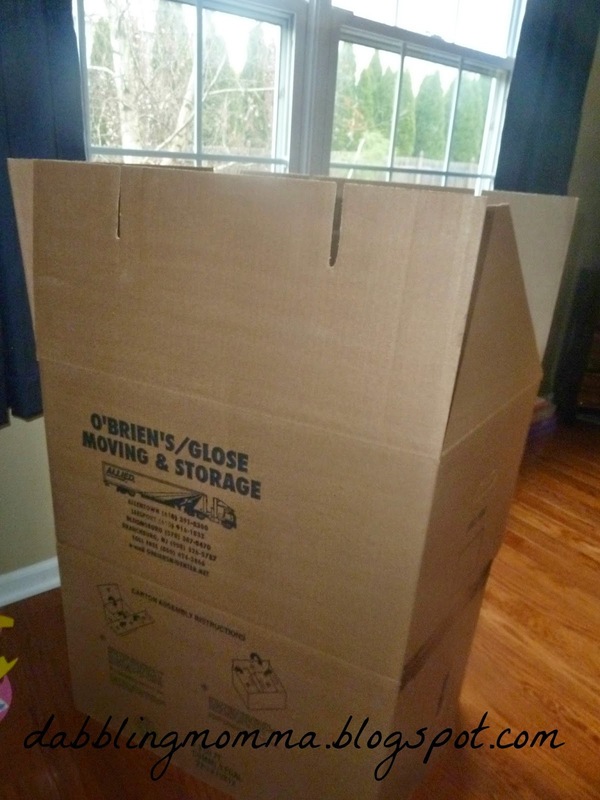 I knew we did not have a box big enough but hubby pulled through with a box from work. It still was not as big as I would have liked but we would make do with what we had. 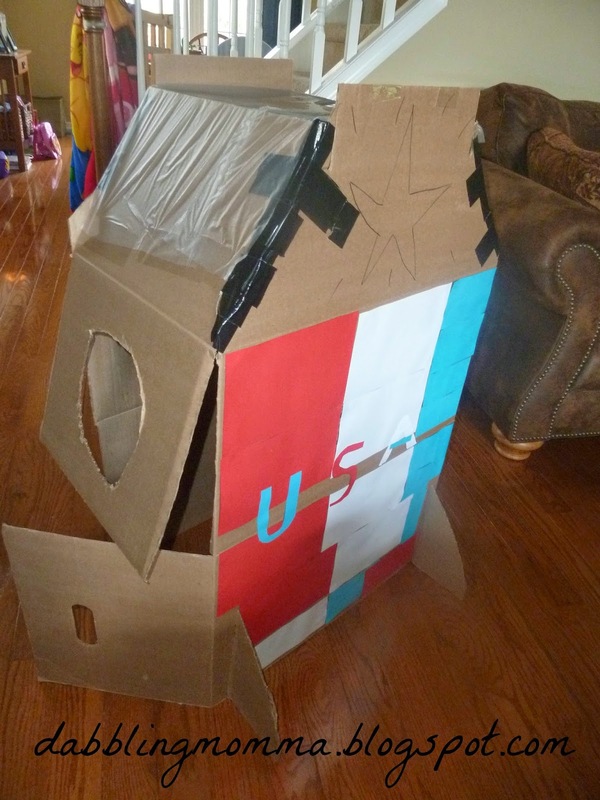 I am not very good at creating things like rocket ships and cars from cardboard boxes but when it's for my babies I do my best. After a morning of cutting and taping we had our version of a rocket ship! I cut a small hole to fit a paper towel tube which acts as the ship's telescope. 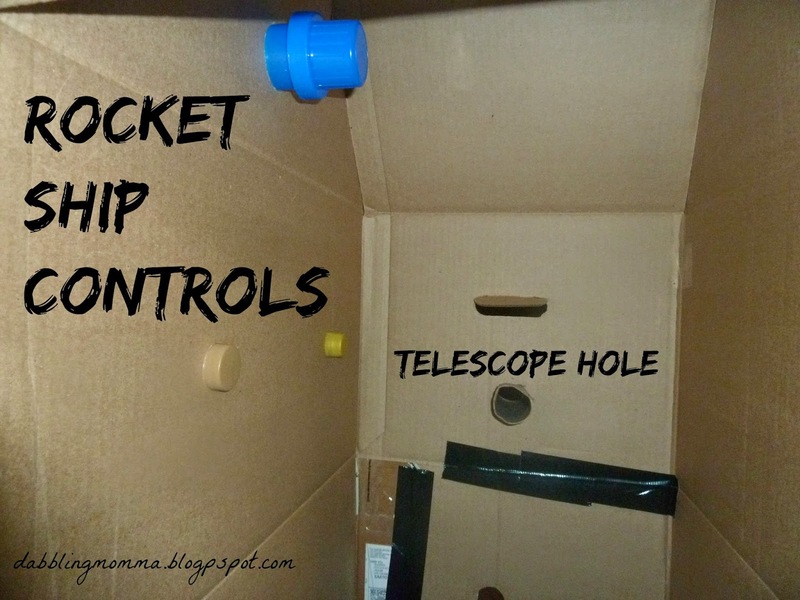 We also added a few caps from bottles of things that were just going into the recycle bin to act as rocket ship controls. 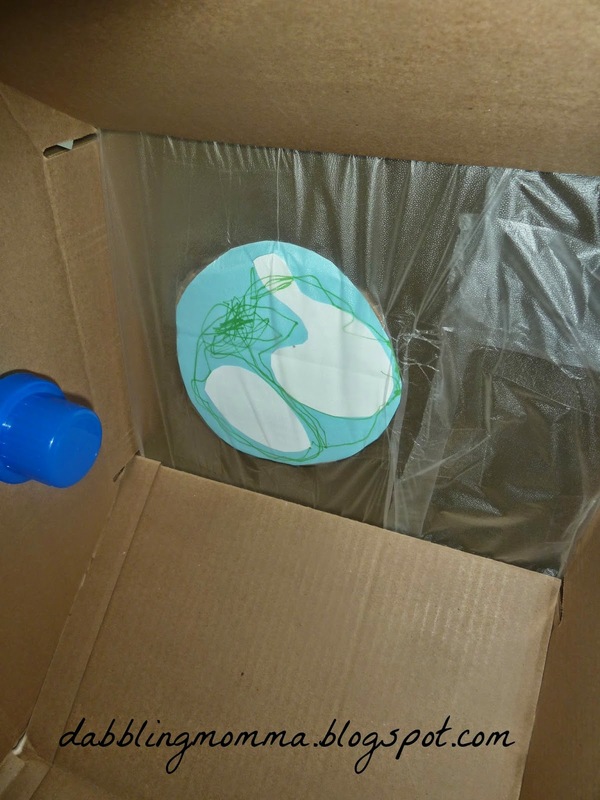 Across the top of the rocket ship I put some cling wrap and then taped a drawing we made of planet Earth so that when you are inside the rocket ship and look up you will have some natural light and also a picture of Earth! 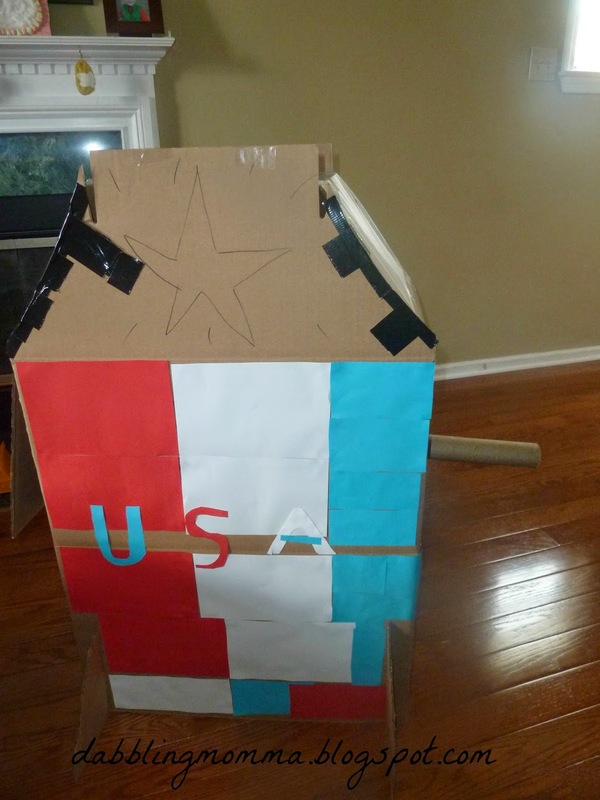 We then finished up by decorating our rocket ship with red, white and blue paper along one side and added the letters U.S.A and some star stickers. 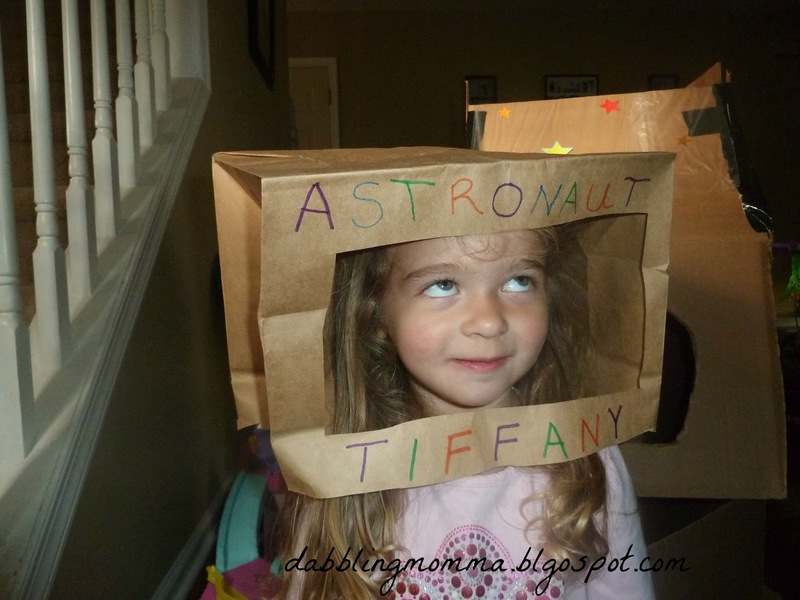 Tiffany then asked for one last thing.......a space helmet! Why, of course! I was going to use a bucket and cut a hole in it but I didn't have a bucket that I was willing to 'chop up' to make a helmet. So, I checked our stash of bags and we happened to have one brown paper bag. Aha! 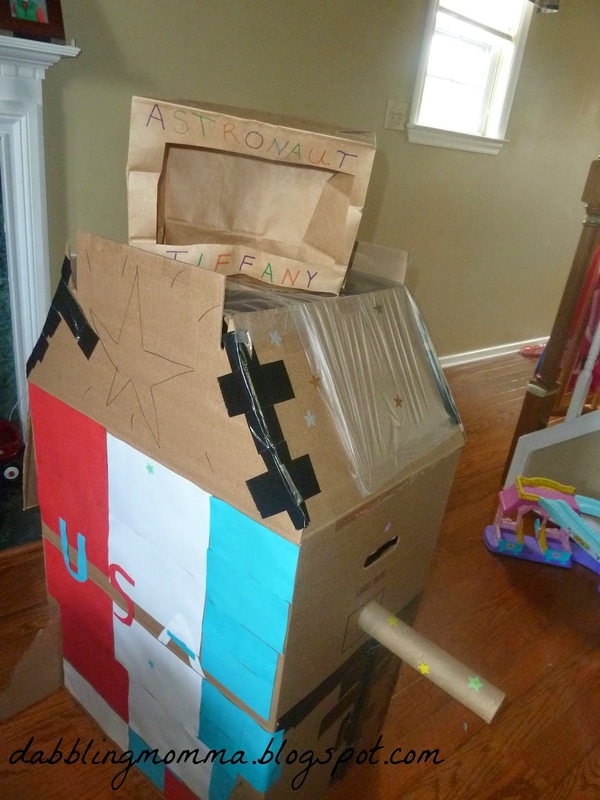 That would be Tiffany's space helmet. She wasn't thrilled with it but she did wear it and at least humored me!! In keeping with the theme of things I visited our local library and picked up some book about space. Starry, Starry night which was non-finction but still kept my preschoolers interest.